Sweethearts – I’m back at home! Already some days ago… but it feels like it was yesterday. What an amazing, inaugural get-together BLAST! 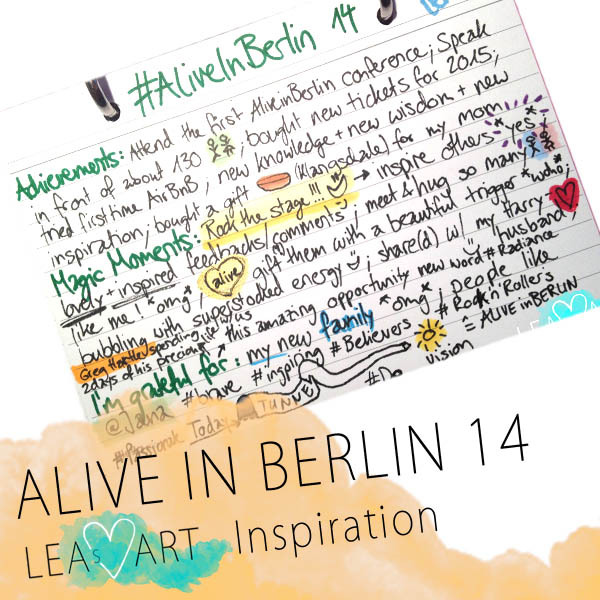 AliveInBerlin took place 30/31 may 2014 – that was last „weekend“ (friday/saturday). Fortunately the next event will take place in may 2015! So grab your ticket! Before the event I vlogged about Aliveness & being a guest speaker 🙂 and how I structorganize my speech. 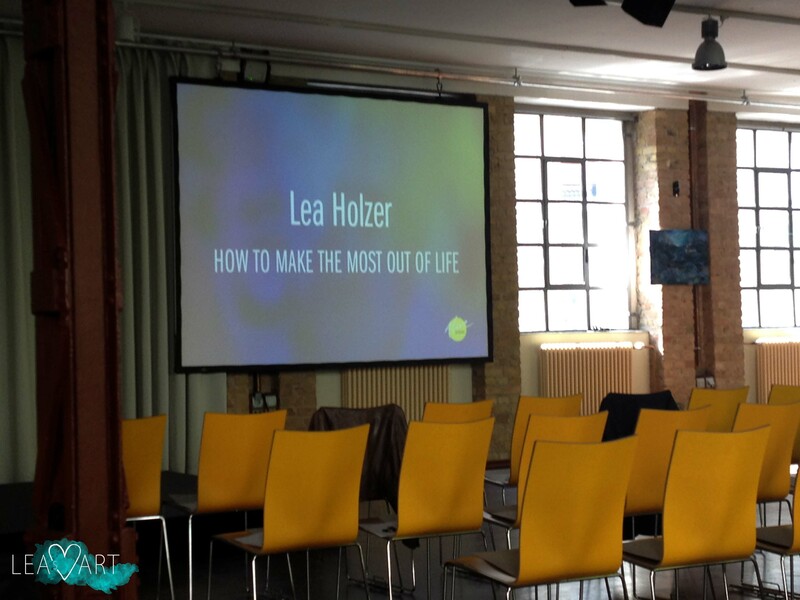 … being honoured to be a guest speaker was that *omg*, that I’m going to do another blogpost about all my insights/experiences. Speaking the first time in front of about 130 people is pretty amazing breathtaking, isn’t it? Being in front of 20 people (like in my studies) and explaining as a volunteer the process of heat pumps is a piece of cake and I always feel alive. I hope you aren’t frightened now about the heat pumps ;-). 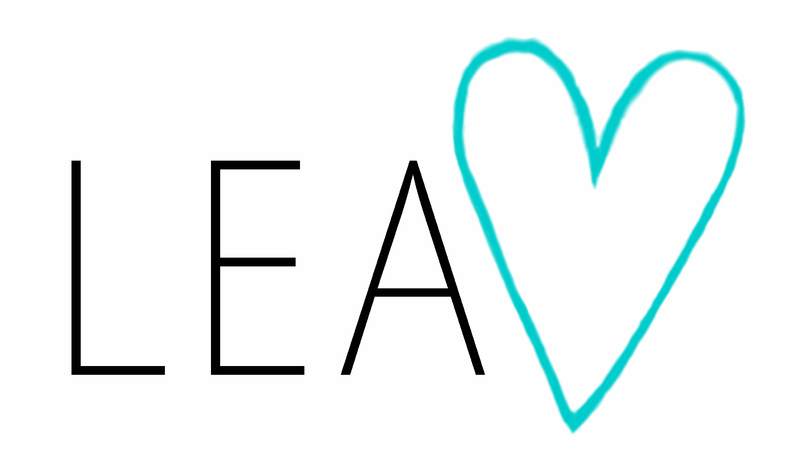 I love to explain, support, inspire and add value – that’s me :). I never mentioned anything here about my skills to add value to my time. Indeed I’m a little pro ;-). 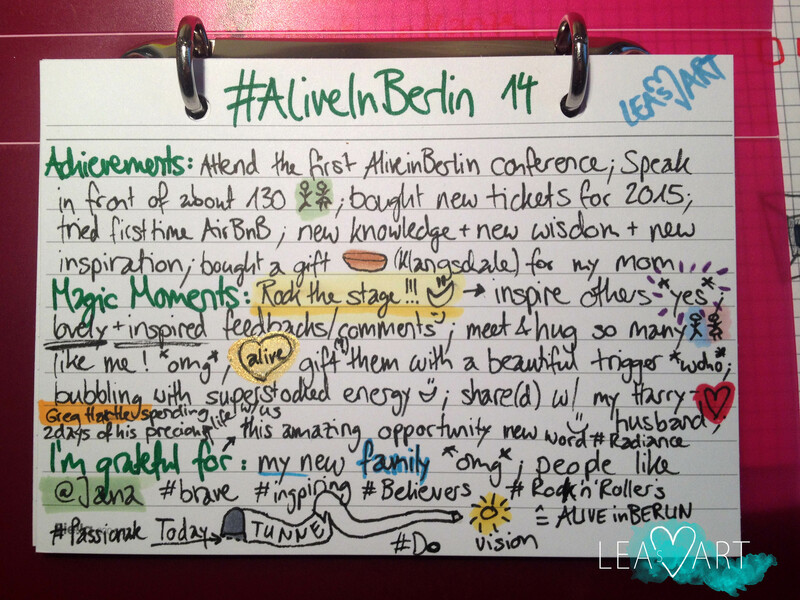 Fortunately the AliveInBerlin-crew recorded all speeches – YAYY! So you can enjoy mine and those of the other phenomenals speakers too :D.
And yes, I’m so grateful for having a new family! It’s just more than a „community“. I love(d) so much, that those people – call them Alivers 🙂 – are driven, passionate, authentic and unique (like me hihi)! We didn’t need to explain that we want to make the world a better place. That’s a go without saying. Hici Türedi: Thank you for being with me and writing my name so impressive. Cathy Goldner: Whenever you don’t see your own „gold“ – write your last name! Reggie Black: Can we become post-it pen pals? Krzysztof Szymanski: Do you want to know when a girl is REALLY in love with you??? When she knows your name by heart. That’s the proof 🙂 Lucky guy! Rakesh Patel: Can we skype too?? Nope, no interruptions – never started! Guy How: Your passion is freaking inspiring! Andre Schuberth: So superawesome to meet you! Put the chisel in the air :). So excited which impact your success boards will have! Pamela Slim: Grateful for your „Body of Work“, that leaded to the book „Body of Work“, so when can build up our „Body of Work“ :D. Vicious cycle in a positive way. Carl Paoli: Looking forward to your new book – hopefully available as an eBook too ?!? Sarah Peck: Inspired about your body language when you were talking on stage. It’s obvious that you do yoga (or sth. similar if I didn’t know). Maybe I should to yoga too ?! Ben Austin Power: New word: radiance and some other strong language haha :). Anne-Sophie Reinhardt: Just the best for the childbirth and the next Alive-Baby with amazing Superpowers! Have a heart.